The fleet’s adrenaline fueled dash through the Pacific in winds up to 34 knots has seen some near record breaking performances but has also taken its toll on the boats with several teams reporting equipment damage. Chris Nicholson’s CAMPER with Emirates Team New Zealand suffered the biggest breakdown last night when they tore their vital J2 headsail in two pieces after the line fixing it to the bow snapped under load. The crew quickly got the flogging sail down below and hoisted a replacement but saw their speed slip from more than 20 knots to 17 and lost more than 60 nautical miles to Groupama while they carried out on board repairs. Navigator Will Oxley said the operation to retrieve the massive sail required the entire crew but had gone off smoothly despite taking place in darkness. "Every manoeuvre in these boats is a case of all hands on deck," Oxley said. 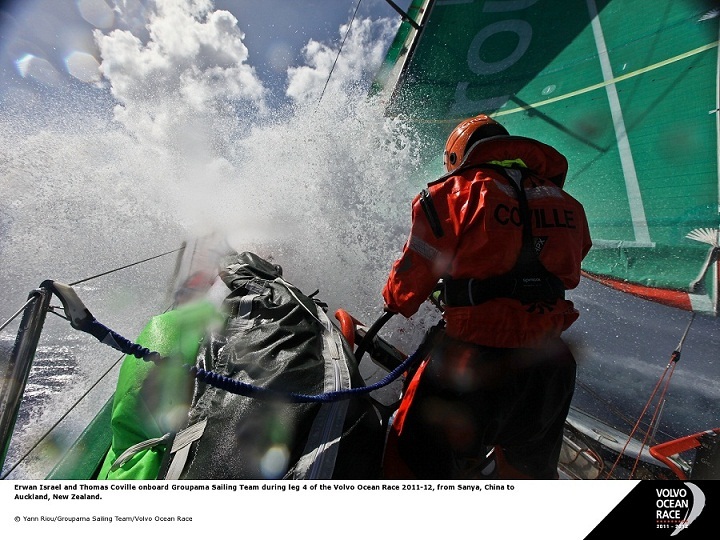 "When you’re close reaching like this going over 20 knots the seas are coming over the side are pretty brutal. "You can’t steer without a helmet and you can’t look into the wind otherwise you quickly get blinded. If you imagine sticking your head out of a car window at 60 kilometres an hour into driving rain. That might give you an indication of what it’s like." "It took about 20 hours to get the sail back up. It was a massive task. They had to get it below, dry it, find where the rip was and come up with a plan for the repair. "Then they had to join the two pieces together and lay cloth over the top of that, glue it and then stitch it. It was a very long procedure. Sometimes I’m not sure how they do it. The sail is so big and the boat is so small that putting it back together is very impressive." CAMPER skipper Chris Nicholson confirmed the setback had been costly. 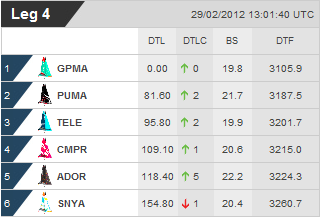 "On the last three position reports we have probably dropped six miles on average on each one. We just can’t afford to have many more of them," he said. Meanwhile, leg leaders Groupama sailing team, second placed PUMA Ocean Racing powered by BERG and fifth-placed Abu Dhabi Ocean Racing, each racked up more than 500 nautical miles (nm) in 24 hours averaging speeds over 20 knots. PUMA sailed 525 nautical miles at an average speed of 21.8 knots in a 24 period, approaching the current race record of 554 nautical miles set by CAMPER during the first leg. Groupama were next best posting 520 nm at an average of 21.6 knots with fifth placed Abu Dhabi turning in a 511 nautical miles 24 hour run at an average of 21.3 knots. "It feels good to be going fast, psychologically at least," said PUMA MCM Amory Ross. "Sailing this way is fun, and it’s what everyone thinks about when they sign up to sail around the world. Groupama watch captain Thomas Coville said the conditions were really aggressive for the crew and the driver in particular. "It’s very wet on board," Coville said. "We’re sailing 90 degrees from the wind and 90 degrees from the waves. "We all have burning eyes at the moment from the salt. These conditions are for sure very extreme but it’s a lot of fun going 25 knots." At the 1300 UTC position report Groupama was more than 3,100 nm away from Auckland and held an almost 82 nm lead over PUMA with Iker Martínez’s Team Telefónica a further 15 nm behind based on their relative distances to finish. CAMPER had dropped to fourth ahead of fifth placed Abu Dhabi, the fastest boat in the fleet with an average speed of 22.2 knots. Mike Sanderson’s Team Sanya remained in sixth, almost 155 nm off the lead.